JeepForum.com > Models > Jeep Cherokee & Comanche Forums > XJ Cherokee Technical Forum > My attempt at a cowl snorkel. My attempt at a cowl snorkel. I recently got a second intake hose from a wrecked xj, so I got inspired to finally make a cowl snorkel. There's a good amount of water crossing where Im moving next year, so why not. About 3 feet of straight, black pvc 3 inch pipe. I cut a hole in the cowl, and a hole in the filter box, and figured out the best way to put it all together. Already, I can feel a HP increase, and I can hear the air it is sucking. 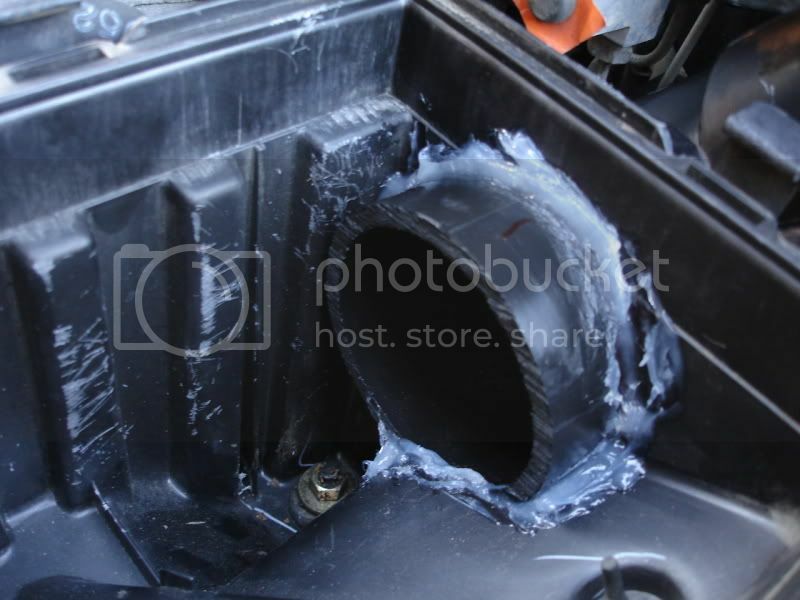 I still need to block off and seal the front of the air box. 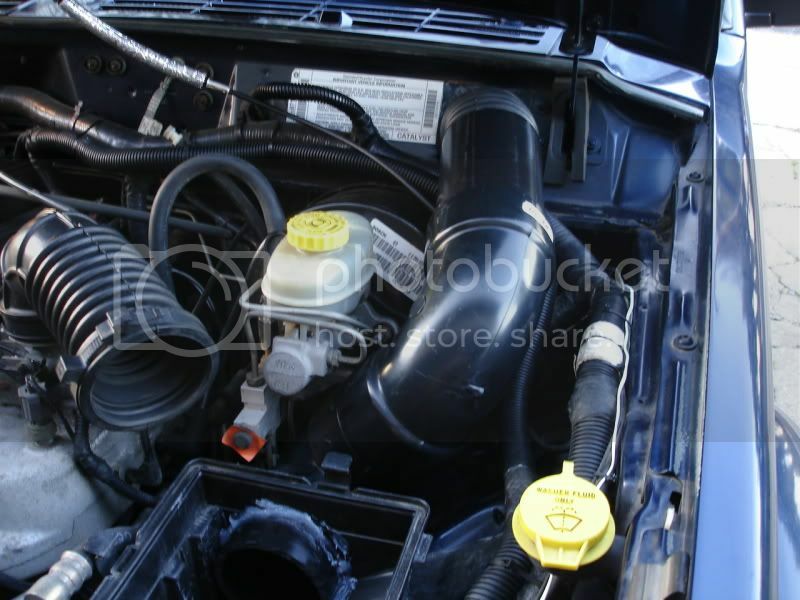 thats diffrent would water comming over your hood get into the air intake? Yeah, thats possible, however, I don't intend on going through more than 2-3 feet of water, ever. When dropping into a crossing, your grill and lights tend to dip pretty low, then level out, this adds some piece of mind, as the factory intake is very low, and right behind the lights. I like that idea, I've been trying to think of something like that as well. I know that some people even continue that pipe over to the other side so that rain doesn't effect it as well. 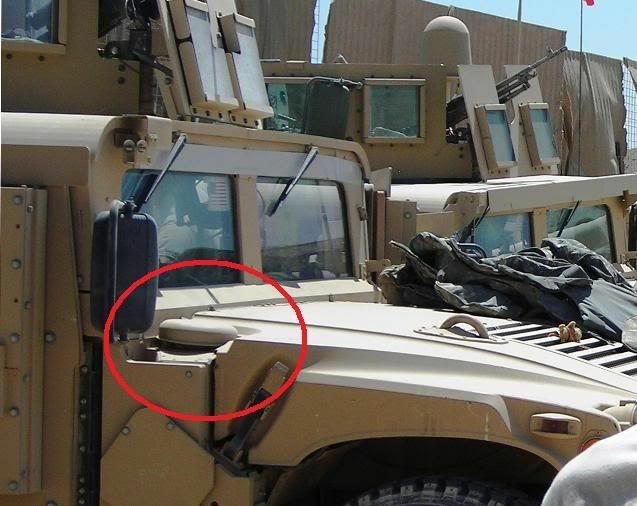 I have been trying to think of a way to make a short hmmwv style snorkel for mine. The problem is that I would have to actually cut the hood a bit to do what I am wanting, but the hinges for hood are where I am wanting to do it. Probably not going to happen the way I am wanting to do it. I like your idea as well with the hard pvc pipe. 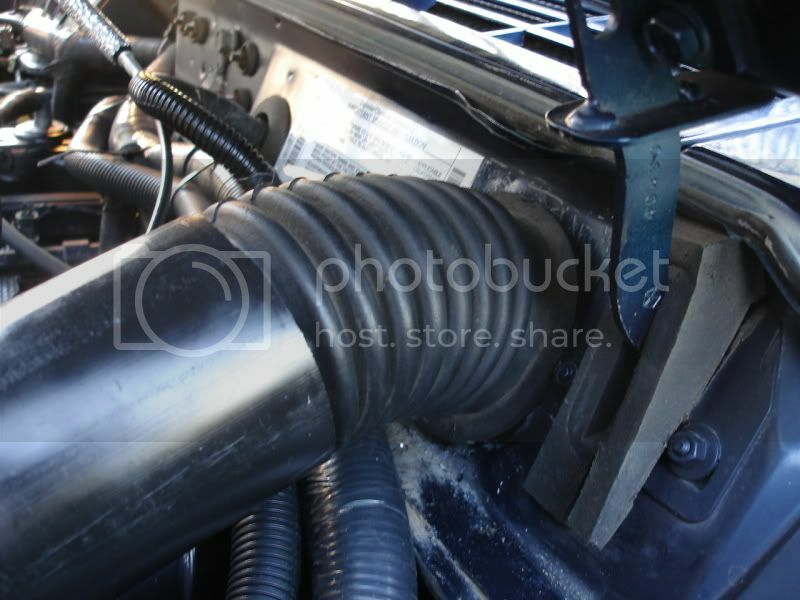 I was wanting to mod an intake with something like this. Last edited by nrpalmer32; 03-15-2009 at 11:27 AM. Yeah, I really don't like cutting sheet metal. I love the look of an un cut, un hacked xj, so all my mods are pretty reversible, or not visible. Since my jeep is only 8 years old, and Im only 17, I've got lots of time to trim fenders, make a rear snorkel, go doorless, cut stuff, all of which are somewhat irreversible. So Im digging the totally stock look, and then you look underneath, and big surprise. Engine: 4.7 V8 2 Wheel Drive. Recovery: umm.....oh yea I have a tow strap. Accessories: I have a tool kit. looks great man.. does it restrict your instant throttle? Yeah, definitely keeping it clean is a good look, I want to keep it somewhat clean looking, thats my prob with the hmmwv intake, it'd take some modding. Yours seems good though and let us know how it works for you! Thanks. Yeah, I really like it. 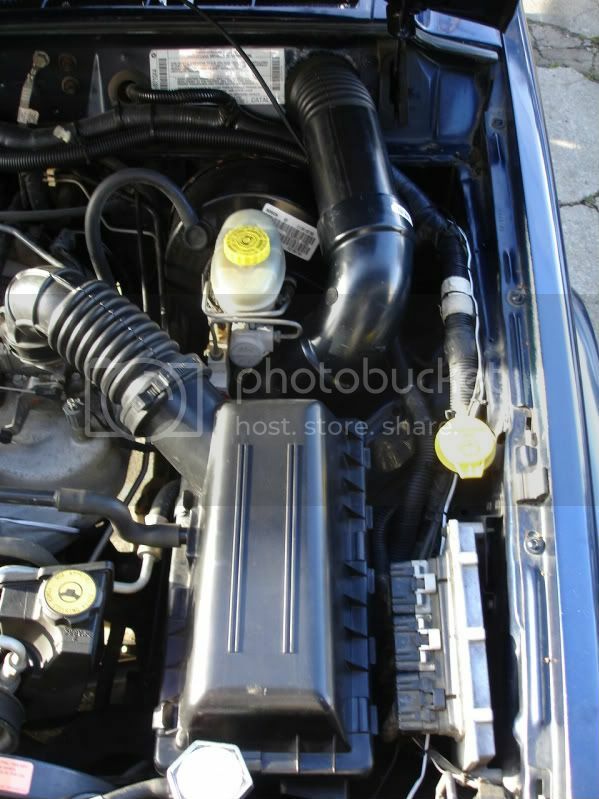 Plus, the tube was about 5 bucks, and the intake hose was free, so this was a very economic mod. Oh, and of course, eventually I will seal the front. And Goldenknob, it does NOT restrict it, in fact, I feel quite a bit of power increase. I would love to do something like that, But my Jeep has ABS. 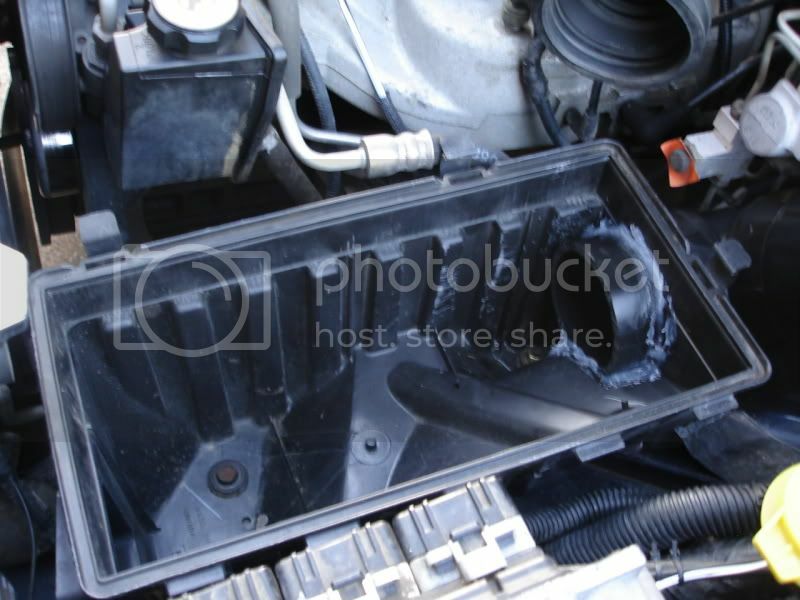 And the ABS is right behind the air box!! Looks good by the way. New 2003 Green Tj Rubicon. 4 Inch lift 305/70/16 MTR's Milemarker 8000 winch. OLD 92 Cherokee Larado. Red and Grey. 7" lift, trim fenders Long arm 4:10 gears with lockers and 35/12.50/15 Toyo AT. So to be parted out to the wifes YJ. Suspension: Rubicon Express 5.5" springs, T&T Y-Link long arms. Armor: have bumpers and skids on everything. See www.ericsxj.com for details. I will say there won't be any problem with rain water with the intake at that location. Heck you could probably splash a bunch of water up onto the hood and into the cowl and it will still be fine. I'm in the process of changing mine from the traditional ARB snorkel to a cowl snorkel also however I am going with a cone filter inside the passenger side cowl. My only concern is how loud it will be with the filter in there. I got most of it done yesterday, but am now back into the work week so it probably won't be done until Thursday. Yeah, water isn't a problem, the face of the cowl/ firewall is angled similar to the windshield angle, so it won't act as a bilge pump or anything. I think I recall you saying you were getting rid of the arb snorkel. Is there a specific reason? Oh, and as far as sound goes, it growls a lot when it starts cold, but once you throw it in gear it quiets down. It will be in the way of the cage I'm going to build. I don't want to go back to just a stock exhaust or exposed cone filter and I still want the fording capability of a snorkel.